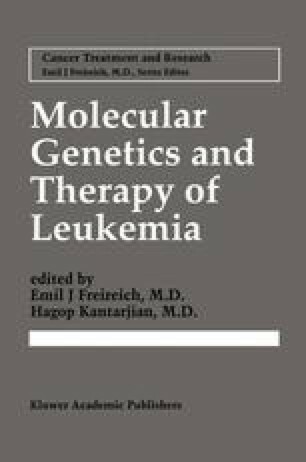 Acute lymphocytic leukemia (ALL) is a malignant hematologic disorder resulting from the clonal proliferation of lymphoid precursors with arrested maturation . The disease can originate in lymphoid cells of different lineages, thus giving rise to B-cell or T-cell leukemias, or sometimes mixed lineage leukemia (see table 1). There are 3,000 to 5,000 new cases of ALL diagnosed every year in the United States [2,3]. In adults it represents 20% of all leukemias  and 1% to 2% of all cancers . The disease has historic relevance, since it was one of the first malignancies reported to respond to chemotherapy  and was later among the first malignancies that could be cured in a majority of children . Since then, much progress has been made, not only in terms of treatment for ALL but also, importantly, in understanding the heterogeneity of the disease. As information has accumulated about molecular aberrations, immunophenotyping, chromosomal abnormalities, and prognostic factors, more rational therapies have been designed. Since most cases are diagnosed in children , our current knowledge has originated from studies in the pediatric population. As differences between childhood and adult ALL became apparent, more research and progress has been made in adults.